Director Mathieu Kassovitz garnered international attention with the great “La Haine,” but it’s been a steady downhill foot race since he started making movies in the English language. Halle Berry has probably wiped “Gothika” from her resume. 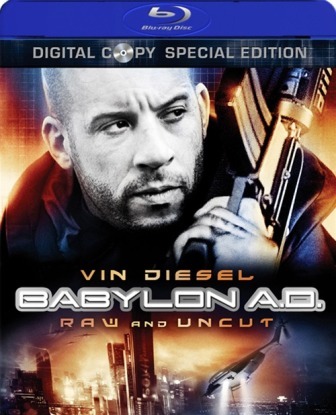 Now, Vin Diesel has his Kassovitz movie to forget, the misguided and deadly dull “Babylon A.D.”. Babylon A.D. is released by Fox Home Video on January 6th, 2009. “Babylon A.D.” is essentially a blend of “The Transporter” movies and dozens of post-apocalyptic visions of the future. In a bleak and desolated future (is there any other kind? ), a mercenary named Thoorop (Vin Diesel) is hired to transport a girl from Russia to New York. Naturally, in a war-torn future, transport is incredibly dangerous. The girl being transported is played by Frenchwoman Melanie Thierry and her guardian is played by the wonderful-but-wasted Michelle Yeoh. In the casting alone, it’s clear that “Babylon A.D.” was primarily intended for the international market. Besides the fact that the main trio in the film is an American, a Frenchwoman, and a Malaysian, great French actors Gerard Depardieu and Charlotte Rampling even drop into the proceedings in small roles, as does Brit Mark Strong. “Babylon A.D.” has made more than double its domestic gross ($23 million) on the international market ($49 million) and that’s by design. As for the movie itself, Kassovitz displays interesting visual flourishes and his eye for design shines through in high definition on the Blu-Ray release. I liked the stark contrast between Thoorop’s dark, urban existence and the green Shangri-La where he picks up his “packages” and a market square bombing is very well-conceived and executed. There’s also a great sequence in a futuristic fight club. Kassovitz has very few flaws as a visual artist. It’s the script and his work with actors where he clearly falters. Diesel has long struggled with under-performing his roles, blurring the line between “playing cool” and “playing asleep,” and he falls way too often to the latter with this one. I know the square-jawed, personality-free hero is more popular overseas - look at Jason Statham’s work in “The Transporter” movies - but it’s not the right fit for this character, who could have used some more charisma and a little less Ambien. And no matter how interesting a film looks or how intriguingly distant its hero may be, a movie still needs a compelling screenplay and “Babylon A.D.” is a jumble of ideas that simply never comes together. Everything about the story of “Babylon A.D.” feels derivative of better films and the dialogue is simply awful. Luckily for viewers of “Babylon A.D.” on Blu-Ray, the format plays up the film’s few strengths. The high definition transfer is one of the best in Twentieth Century Fox’s catalog and the audio mix is nearly perfect. “Babylon A.D.” is immensely more watchable on Blu-Ray that it would be on standard DVD or probably even with most modern movie theater projection and sound systems. As for special features, they’re hit and miss, but maybe someone at Fox has finally listened to my passionate pleas because the studio’s habit of mini-featurettes finally comes with a “Play All” feature. No more bouncing back to menu screens every four to five minutes. The featurettes, which can be views “BonusView” or picture-in-picture as the movie rolls, are surprisingly extensive and cover the source material and entire production over more than 35 minutes. Broken apart, the featurettes are “Babylon Babies,” “Arctic Escape,” “Fit For the Screen,” “Flight of the Hummers,” and a very cool animated film called “Prequel to Babylon A.D.: Genesis of Aurora”. The featurettes are a perfect mix for fans. “Babylon A.D.” also includes a deleted scene, still galleries, trailers, and an inside look at the straight-to-DVD “behind Enemy Lines: Colombia”. It’s far from a “special edition” level of bonus features, but it’s a good mix that complements the film well. Overall, the Blu-Ray release of “Babylon A.D.” is surprisingly well put-together, even if the movie itself is not. ‘Babylon A.D.’ is released by Twentieth Century Fox Home Video and stars Vin Diesel, Michelle Yeoh, Melanie Thierry, Gerard Depardieu, Charlotte Rampling, and Mark Strong. It was written by Mathieu Kassovitz and Joseph Simas and directed by Kassovitz. It was released on January 6th, 2009.